Bands of this ilk are often touted as 'psychedelic' by dealers presumably to boost collectors' interest and asking prices. Pleasant flowery folk-rock-pop with occasional sound effects it may be, mind-expanding it ain't. Just a slightly hipper version of the Fifth Dimension in many cases and include the likes of Forum, Split Level and Yankee Dollar here too. If you like trendy but slightly fabricated MOR sixties pop, then great. Enjoy it - I ain't knockin' it, just the dealers who hype it as something it isn't. Thanks a lot, oe for this nice chapter in sunshine-pop. First time i ever heard their name. Thanks for letting me join your great blog. I LOVE sunshine-pop-psych. 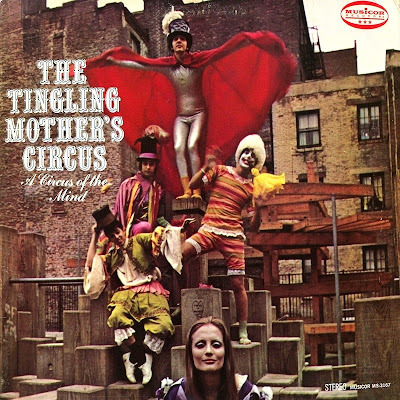 I was not familiar with THE TINGLING MOTHER'S CIRCUS. Great stuff! Thank you so much.